Basenjis originated as African hunting dogs. They have a short coat, deal with heat well, and dislike the cold. They are independent and can be a bit stubborn, but they love to be around their people. They are a medium sized breed that grow up to weigh between 20 and 25 pounds. Basenjis have a few unique health concerns that come from their genetic makeup. This breed is prone to a kidney disorder that affects how your dog processes protein and sugar. They are also prone to a malabsorption disease that is similar to a food allergy. This is akin to IBS in humans. Basenjis sometimes have hypothyroidism, which is when the thyroid isn’t producing enough hormones. Symptoms of this include, dry, patchy fur, lethargy, or mental dullness. They are susceptible to a few genetic eye conditions including retinal atrophy, which causes progressive blindness. Like many other breeds, Basenjis are also likely to experience hip dysplasia, which is when the leg bone doesn’t have a proper fit with the hip joint. These conditions sound serious, but with proper care, there is a good chance that your Basenji will not encounter these diseases. Because Basenjis can have digestive problems, it’s important to find a dog food that is easy on their stomach. The wrong ingredients can cause pain and irregular bowel movements that can be unpleasant to deal with. One of the most common allergens in dogs is grains. Many pet owners avoid grains like corn, soy, and wheat because it is believed that they cause allergic reactions in dogs. There are lots of different grain free formulas on the market that use carbs that are easier to digest like rice and potatoes. There are also dog foods that have simple ingredients lists to avoid allergic reactions. If you find that your dog can’t digest these formulas, it should be easy to figure out what the problem food is. Fats are an important part of your Basenji’s diet that should not be overlooked. Animal fats are good for dogs and necessary in certain amounts. Along with animal fats, other healthy fats are necessary. These keep your dog’s skin moisturized and makes their coat glossy. A diet without fats can make your dog’s skin dry and itchy. Omega fatty acids are great for dogs and help with lots of bodily functions. One of the best sources for Omega fatty acids is fish and fish oils. It can also be found in flaxseeds. Omega fatty acids may also help with itchiness related to environmental allergies. If your dog has a sensitive stomach, it’s especially important not to feed them table scraps. The food we prepare for ourselves has extra fats and seasonings that may not settle with your dog’s stomach. Along with the possibility that it may make your dog ill, table scraps can lead to weight gain and obesity. While chubby pups can look cute, extra fat puts a lot of strain on their skeletal system and organs. Extra weight can make exercise difficult, which could lead to more weight gain. Feeding your dog table scraps also promotes annoying begging, which can be difficult to stop, particularly with this stubborn breed. Certain nutrients may help support a healthy thyroid in dogs with symptoms of hypothyroidism. Some of these symptoms include lethargy, mental dullness, loss of fur, and dry skin. Also, weight change unrelated to diet and exercise can be another sign of hypothyroidism. Studies have shown that kelp, with its high levels of iodine, can improve thyroid function. Look for dog foods that contain kelp or dried kelp to get those good nutrients. Foods that contain a good mix of fruits and vegetables are more likely to include kelp than the foods that don’t have produce. If you’re having a hard time finding dog food with thyroid-healthy ingredients, there are supplements on the market that can be added to your dog’s diet. In general, fruits and vegetables make a difference in your Basenji’s health. Virtually all dog foods contain added vitamins and minerals in supplement form to comply with market standards. However, dog foods with fruits and vegetables deliver the nutrients your dog needs in a form that is easily absorbed into the body. Produce also provides lower calorie energy, while keeping your dog full. Fruits and veggies also add fiber and antioxidants. Antioxidants found in orange produce, like carrots and sweet potatoes, are good for the eyes and may slow the progression of vision loss. This breed is prone to eye disorders, so staving off vision loss for a few extra years may improve your dog’s quality of life. The right diet may also help prevent kidney problems. Most importantly, there should always be fresh water available for your Basenji to drink to help flush out toxins. Your dog’s source of protein is also important for kidney health. Try to find the best sources of protein for your dog, like whole meats or eggs. Avoid animal by-products, as these tend to be the lowest quality protein sources. Some veterinarians even think that lower protein diets may benefit your dog’s kidneys. It’s best to check with your vet before switching to a low-protein diet because dogs are meat-eaters and protein is important to their muscle development and weight stability. Your dog will love the crunchy kibble mixed with the freeze-dried meaty shreds in this dog food. The kibble uses chicken, chicken meal, and eggs for its major protein sources. Chicken meal is good for dogs because it contains glucosamine and chondroitin, which supports joint health. The dried meat is composed of turkey, chicken, and turkey liver. For carbohydrates, there is chickpeas, peas, and tapioca. This grain free formula is easier on your dog’s stomach than corn, wheat, or soy. Salmon oil adds healthy oils to the food to keep skin moisturized and protected. There are also fruits and vegetables in this formula in varying amounts. It includes apples, carrots, cranberries, butternut squash, kelp, broccoli, and blueberries. Along with the vitamin and mineral supplements, these fruits and vegetables add nutrition and flavor to this food. This is a good option for hunting dogs with no food allergies. For an affordable price, this formula has a higher protein and fat content for your working Basenji. For its protein source, it uses chicken, chicken meal, fish meal, and egg. Chicken meal is good for their hip joints and fish meal provides healthy Omega 3 fatty acids. For carbohydrates, this formula uses corn, brewers rice, and whole grain sorghum. Corn isn’t necessarily a bad source of energy, but it can cause problems with dogs that have allergies. This food also contains added fiber for regular bowel movements. Unfortunately, this dog food doesn’t contain produce or probiotics. 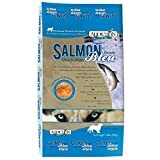 Addiction Salmon Bleu Grain Free Dry Dog Food, 20 lb. Addiction Pet Foods is based in New Zealand and makes a grain free formula with simple ingredients. This food uses salmon meal as its meat source. Some dogs have problems digesting chicken, so it may help with some tummy troubles. Instead of grains, it uses potatoes, tapioca, and peas for its energy source. These carbohydrates digest easily, but don’t provide a ton of long lasting energy. This food also has a good amount of dried kelp, which can help with your dog’s thyroid function. It also has dried cranberries, blueberries, and spinach. These fruits and vegetables are often considered to be “super foods” because they are packed with antioxidants. There aren’t many ingredients in this food, but that may be better for your dog’s sensitive digestive system. This food has a short ingredients list made especially for dogs with allergies. It may be a good option for Basenjis with kidney problems because it contains less protein than other premium brands. For protein, it uses whole venison. Venison is a good meat for dogs because has iron that Basenjis need to build red blood cells. For carbohydrates, it primarily uses sweet potatoes. Not only are sweet potatoes a source of energy, but they also contain vitamins, minerals, and antioxidants. There is also potato protein, starch, and pea protein in this formula. Canola oil and flaxseed add fat and Omega fatty acids to the mix. Beyond these ingredients, there isn’t much other than the basic blend of vitamins and minerals. It doesn’t have a lot of fiber or probiotics, but the carbs are easy to digest. This company doesn’t use artificial flavors, colors, or preservatives, so that may eliminate some stomach problems. This is another food with a limited ingredients list for Basenjis with digestion issues. This one uses lamb meal for its protein source. Lamb is generally easy to digest for most dogs. Brown rice and white rice mix quick and long lasting energy to keep your dog energized all day. Beet pulp is added to provide fiber for regular bowel movements. Chicken fat adds necessary fat for absorbing fat soluble vitamins. Besides these ingredients, there is nothing else but vitamin and mineral supplements. This food also contains glucosamine and chondroitin for joint health. Unfortunately, this food does not contain a great source of Omega fatty acids like in fish. Your dog should be able to digest this food easily, but if there are allergic reactions, it’s a great way to find the culprit. Basenjis are known for digestive problems, so they may need a little extra help breaking down food. This supplement contains a mix of prebiotics, probiotics, digestive enzymes, and herbs that aid digestion. They come in capsules filled with powder. These can be opened and sprinkled on your dog’s food for easy delivery. These can help with irregular bowel movements and the supplements may work in as little as a week. 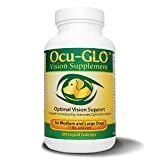 These supplements claim to work at the cellular level to improve and protect eye health in dogs. These are meant for dogs that are prone to cataracts and degenerative eye disease. It primarily contains antioxidants that prevent and reverse eye damage. Because it is believed that these eye conditions occur due to oxidation, antioxidants fight the free radicals in the body. It may not cure eye disease, but it may keep your dog from becoming blind. While your dog’s food contains most of the vitamins and minerals they need, if your Basenji has malabsorption issues, they may need another source of nutrition. 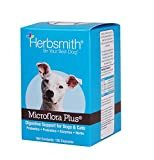 These multivitamins are soft and flavored, so dogs will take them without issue. They contain Vitamin A for eye health, Vitamin E for skin protection, and B vitamins for energy. These contain all of the vitamins and minerals your dog needs to be healthy. How much do Basenjis eat? They are medium sized dogs, so they only need about a cup of food a day. Add more or less depending on their weight, activity levels, and age. How often should I feed my Basenji? Feed your dog twice a day to keep energy levels up. When is the best time to feed my Basenji? Feed your dog once in the morning and once in the evening. Can I feed my Basenji “People Food”? For this breed, it’s especially important not to feed your dog table scraps. Not only does it cause weight gain, but it can irritate your dog’s stomach. How can I tell if my Basenji is overweight? There should be a clear waistline between the ribs and the hips. You should be able to feel your Basenji’s ribs, but not feel them. How can I tell if my Basenji has digestion problems? It may be unpleasant, but take a look at your dog’s bowel movements. If they are loose or have an especially bad odor, they may have food allergies. Basenjis make great family pets. They are loving and intelligent dogs. Because the breed is prone to food allergies and intolerances, it’s important to know what ingredients are in your dog’s food. Grain free formulas work well with most dogs and there are plenty of these foods on the market. Digestion aids like fiber and probiotics may be necessary if limited ingredient diets aren’t enough. Foods with fruits and vegetables are good for this breed because they have a good mix of nutrients that work together for maximum absorption.